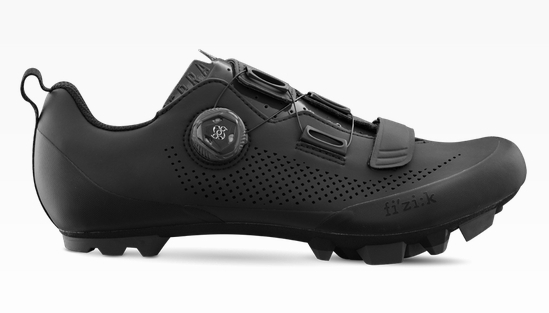 Product information "Fizik Terra X5 MTB Shoe black"
Tough, light, comfortable and versatile, the fi'zi:k Terra X5 MTB shoe delivers winning all terrain performance, with adaptive fit, trail protective materials and pronounced treads for off-road grip. Because Terra X5's asymmetric opening is fastened by a single micro-adjustable Boa L6 Dial B dial running a steel-coated nylon lace through tough, light, 'Slipstream' plastic guides, and combined with a 25mm microfiber and Velcro strap, it's easy and quick to get a precision fit for any foot shape. That optimum fit means comfort and performance. Its Laser Perforated Microtex upper and lightweight, breathable inner mesh provide flexible support and cooling while the thicker tongue material provides vital trail impact protection. The Composite Carbon Fiber vented outsole and fi'zi:k Cycling Insole combine to give support, comfort and tremendous power transfer. It has light, tough woven tape heel loops for carrying and storage. The Terra X5 inspires trail confidence thanks to its all-terrain grip provided by pronounced tread that fully encompass the heel section, on the toe-box and across the instep and outstep up to the cleat recess, creating a sturdy support for riders preferring clipless 'trail' pedals with a small platform. Related links to "Fizik Terra X5 MTB Shoe black"
Customer evaluation for "Fizik Terra X5 MTB Shoe black"